In this context, the pure doctrine of jihad—warfare against infidels—was lost to the average Muslim, who watched and suffered as Muslim empires and sects collided. It was only during the reign of Imad al-Din Zengi (d.1146)—a particularly ruthless Turkish warlord and atabeg of Mosul and Aleppo—and even more so under his son and successor, Nur al-Din (r.1146-1174), that the old duty of jihad was resuscitated. They founded numerous madrasas, mosques, and Sufi orders all devoted to propagandizing the virtues of jihad and martyrdom. Contemporary literature makes clear that Islamic zeal (or, in modern parlance, “radicalization”) reached a fever pitch during their reigns. It was in this context that a Kurd from Tikrit emerged on the scene. Salah al-Din—the “Righteousness of Islam,” or Saladin (b. 1137)—formerly one of Nur al-Din’s viziers, conquered Fatimid (Shia) Egypt in 1171. On his master’s death, he quickly moved and added more Muslim territories—Damascus and Aleppo—to his growing empire, thereby realizing the crusaders’ worst fear: a united Islamic front. By spring of 1186, Saladin’s empire had so grown that he felt the time was right: “We should confront all the enemy’s forces with all the forces of Islam,” he told a subordinate. Before long, the crusader kingdoms had to marshal all their forces to meet him, near Nazareth in the summer of 1187. Although Saladin had more men—approximately 30,000, half of whom were light cavalry and many of whom were slave-soldiers—the Christians, under the leadership of King Guy, had assembled the largest army since capturing Jerusalem, consisting of some 20,000 knights, including 1,200 heavy horse. Aware that a head-on assault was futile, Saladin withdrew his forces, went to and besieged the nearby crusader kingdom of Tiberias. Some twenty miles of stony, parched land—with no natural water sources or wells—stood between the crusader army and the besieged city. Nonetheless, on July 3, they set out to relive it. On learning that the crusaders had fallen for his trap, Saladin rubbed his hands with glee: “This, indeed, is what we wished for most!” He immediately dispatched his light cavalry to harry the crusaders. Guy hurried the march: the real battle—and water—lay in Tiberias; but when swarms of Muslim archers bogged down his rear force, the king ordered the entire army to halt and fight near a parched and ominous double hill formation, known as the Horns of Hattin. As soon as they [Franks] were encamped, Saladin ordered all his men to collect brushwood, dry grass, stubble and anything else with which they could light fires, and make barriers which he had made all round the Christians. They soon did this, and the fires burned vigorously and the smoke from the fires was great; and this, together with the heat of the sun above them caused them discomfort and great harm. . . . When the fires were lit and the smoke was great, the Saracens surrounded the host and shot their darts through the smoke and so wounded and killed men and horses. By now the crusader army consisted of a confused mass of desperate men stumbling over the bodies of their dead; forests of prickly shafts appeared everywhere—in man, beast, and earth. Encircled by an ever-shrinking ring of fire and Islamic horsemen, tormented by arrows and thirst, the Fighters of Christ finally succumbed. The rout was complete, the gloating great: “This defeat of the enemy, this our victory occurred on a Saturday, and the humiliation proper to the men of Saturday [Jews] was inflicted on the men of Sunday [Christians], who had been lions and now were reduced to the level of miserable sheep,” concluded one Muslim contemporary. 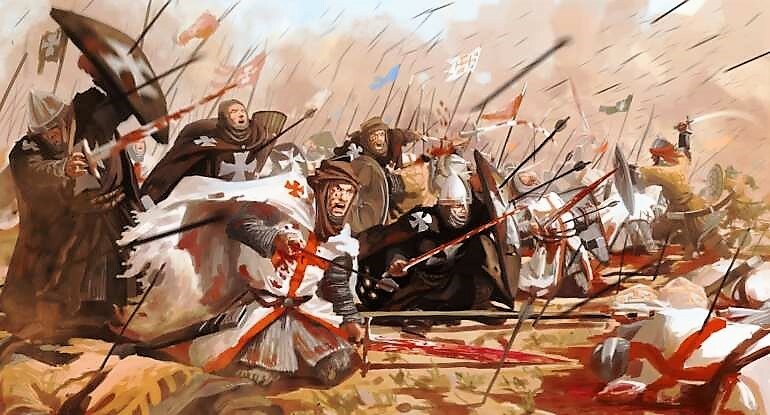 In the end, single Muslim soldiers were seen dragging as many as thirty crusaders with one rope, any of whom would once have terrified the same—so maddened with thirst and reduced to delirium were the Europeans. Saladin “dismounted and prostrated himself in thanks to Allah.” Next he ordered the mass slaughter of the military orders—those warrior-monks most committed to the cause, the Knights Templars and Hospitallers: “With him was a whole band of scholars and Sufis and a certain number of devout men and ascetics; each begged to be allowed to kill one of them, and drew his scimitar and rolled back his sleeve. Saladin, his face joyful, was sitting on his dais” as they carved off the heads of their Christian captives. Then “that night was spent by our people in the most complete joy and perfect delight . . . with cries of ‘Allahu Akbar’ and ‘There is no god but Allah,’ until daybreak on Sunday,” piously concluded a Muslim chronicler. Finally, adding insult to injury, Saladin had the True Cross—for centuries Christendom’s most revered relic, which was brought by the crusaders to and captured by the Muslims at Hattin—spat upon and dragged upside down in the dirt. The rest is history—Jerusalem is now the capital of Israel—and can be accessed in Sword and Scimitar: Fourteen Centuries of War between Islam and the West.